The economic crisis and the ruble's devaluation have led to some Asian airlines cancelling their Moscow flights. However, FlyDubai, Etihad and various Chinese carriers are looking to expand their Russia services. The first few months of the year witnessed a reduction of flights from Asia to Russia, with three major carriers from the continent cancelling flights. However, a few Asian and Middle Eastern carriers are now bucking the trend and expanding their Russia operations. The devaluation of the ruble (in December 2014 the ruble fell by 50 percent to the dollar) led to a drastic reduction in demand for international air carriers in Russia, which forced at least three Asian companies to stop operating in the country. As of June 1, 2015, Cathay Pacific Airways stopped flying to Moscow. Company representatives say the decision is due to “commercial reasons” and “high operating costs.” The Hong Kong-based carrier follows in the footsteps of Thai Airways, which stopped flying to the Russian capital in February. In addition, popular budget carrier Air Arabia cancelled its flights to Sharjah from Yekaterinburg, Rostov-on-Don and Kazan. Meanwhile, the market is witnessing a contrary trend: FlyDubai, Etihad Airways and Sichuan Airlines are increasing their flights to Russia. The Middle Eastern and Chinese carriers are putting greater emphasis on flights to Russian regions, especially to cities in the Asian part of the country. Last month, In May Sichuan Airlines started a flight from Chengdu to Moscow. Despite the stagnation of the Russian market last year, Etihad Airways had announced plans to increase freight capacity and the frequency of flights to the country. From October 2015, FlyDubai will fly to Novosibirsk and Nizhny Novgorod, expanding its network in Russia to ten cities. Oleg Panteleev, head of the Aviaport analytical services agency, says the regions are offering these airlines better condition than Moscow's three busy airports - Vnukovo, Sheremetyevo and Domodedovo. Chinese companies continue consolidating their positions in Russia. 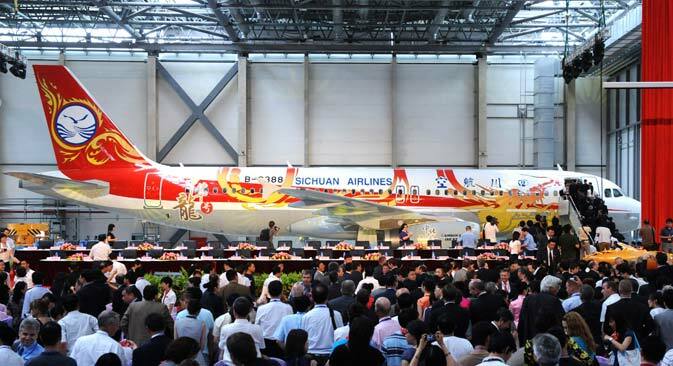 “Currently, besides the Russian airlines flying to China, there is also the active presence of Air China, China Eastern, China Southern and Hainan Airlines,” says Svetlana Pyatikhatka, Executive Director of the World without Borders Tourist Association. China is now connected with Moscow, St. Petersburg, Yekaterinburg, Novosibirsk, Krasnoyarsk, Irkutsk, Chita, Ulan-Ude, Khabarovsk, Vladivostok and Yuzhno-Sakhalisk, Pytikhatka adds. The increase in flights from Asia reflects the demand from the continent, says Alexander Burtin, Director of Tez Tour. Burtin says the ruble’s devaluation will lead to a 35-40 percent year over year fall in overseas travel by Russians this year. “The biggest fall is in the long-distance flights (Thailand, Sri Lanka). The fall in demand at the end of 2014- beginning of 2015 was up to 60 percent,” he says. At the same time ticket prices in rubles have been corrected in accordance with the strengthening of the ruble (currently the exchange rate has stabilized at 51 rubles to 1 dollar). “Due to the approaching vacation season, as well as the stabilization of the ruble, in April-May 2015 the demand for trips to Middle Eastern and Asian destinations has increased by 53 percent in comparison to the previous four months,” says Philip Brinkman General Director of the Tripsta online tourist agency. Brinkman says that currently the most popular Asian destinations for Russians are India, Indonesia and China, while the most popular Arab country is the United Arab Emirates. Analyst Oleg Panteleev says the devaluation of the ruble will make Russia more attractive for international tourists. In 2015 tourists from the Koreas, Taiwan and India began showing more interest in Russia. For the first time, these three countries entered the list of top ten sources of foreign tourist arrivals to Russia, Panteleev said.